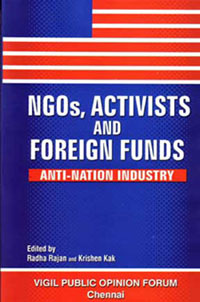 An explosively revolutionary book entitled 'NGOs, Activists and Foreign Funds: Anti-Nation Industry' jointly edited by two fearless journalists and writers Radha Rajan and Krishen Kak and published by Vigil Public Opinion Forum (VPOF), Chennai was released by Narendra Modi, Chief Minister of Gujarat, in New Delhi in September 2006. Within a short period of six months this first edition has been sold out thanks to overwhelming public response. The second edition has recently been published with some additional material of great national significance. When the first edition of this book came out in 2006, I had reviewed it in these columns. In the introduction to my detailed review, I had observed as follows: 'In an era of 'Publishing abundance' unfortunately ushered in by our perverted democracy and technological explosion, looking for needles in hay stacks has become the full-time occupation of a conservative reader who still clings to the old-fashioned belief that quality is all, I don't feel ashamed to confess that I am a conservative in regard to my reading habits and I am immensely happy now that I have found 'a needle'.' My initial immediate impressions expressed in these words have been solidly confirmed and vindicated by the upgraded quality and content of the second edition of this avant-garde book. This book exposes the evil anti-national designs of many NGOs and activists operating in India with great enthusiasm and gusto with the full patronage and strong political support of the anti-Hindu UPA Government in New Delhi. All these NGOs are fully committed to their supreme objective of De-Hinduising the Indian State. This in effect means rendering the Hindu identity to any aspect of our national life illegitimate and irrelevant in public life and public discourse, with the subterranean objective of eroding the 'Hindu Consciousness' in the Hindus and finally wiping out the Hindu FACE of the nation. Nehruvian secularism is committed to the cause of de-nationalizing and de-Hinduising Indian polity. De-nationalizing involves the processes of devaluing both nation and nationality. De-nationalizing the Indian State, Radha Rajan asserts, has resulted in deadening our consciousness to the ignominy of the rise of a foreigner in Indian polity who aspires to become our Prime Minister. What emerges from this book can be summarized in the following equation: Mohammedanism + Missionaryism + Marxism + Macaulayism + Nehruvian Secularism + UPA Soniaian Pseudo-Secularism = Promotion of Terrorism in India. All the anti-national NGOs considered in this book have been operating in India under the self-chosen umbrella of this overriding, indeed axiomatic pseudo-secular equation. Against this known and dark background, several NGOs and their activities have been analyzed with facts and figures which is a wake up call to all the nationalist Hindus of India. This book is indeed a veritable mine of information on many anti-national and anti-Hindu NGOs and certain high-profile individuals who are brazenly parading themselves in the forefront of anti-India and anti-Hindu propaganda on various public, social and political issues. Based on a careful analysis of the activities of many NGOs, this landmark book establishes a tangible relationship between the anti-India and the anti-Hindu dimensions of these sinister organizations and their leaders with questionable character and antecedents. In the view of Radha Rajan and Krishen Kak, there can never be any Indian nationalism that is contrary to or separate from Hindu nationalism. It is a natural corollary that the continuing attempts to de-Hinduise our polity by these NGOs and their activists have dangerous implications for the national security and the relationship of so-called religious minorities in India with Hindus and the Indian State. How these NGOs are de-nationalizing the Hindu consciousness in a cold and calculated manner with the covert and overt help from the government of India? A scrutiny of the loose coalition of opportunistic (only in respect of India) anti-Hindu Christians, Muslims, Communists and Nehruvian secularists who are indeed guilty of an ardent advocacy of secular sedition when they dismiss age-old Indian nationalism rooted in age-old Hindu culture and Sanathana Dharma with contempt, often mixed with a hateful denial of the concept of Hindu India's territorial integrity. Politically and socially criminal attempts to use history and social science to indoctrinate the young and impressionable minds with the agenda to de-root the Hindu community from its cultural enclave of geographical nationalism and all that goes with it. UPA government has carefully planted many activists belonging to the anti-Hindu category as Members in the Central Advisory Board on Education (CABE) and National Integration Council (NIC). This also includes the Archbishop of Delhi! It is indeed regrettable that many of the activists under the scanner in this book under review find a pride of place in both CABE and NIC. This fact is by no means incidental but by all means planned and fundamental. The most comic aspect in this context is that there is not a single member in CABE or NIC to represent the interests of more than 800 millions of Hindus in India even while Muslims, Christians, Marxists and Nehruvian Secularists and page boys of Sonia Gandhi have been nominated exclusively to represent the so-called minority interests in general and the overriding sovereign anti-Hindu secular interests in particular. These anti-nation, anti-Hindu 'peace' and 'human rights' activists have the same contempt for all Hindu organic and traditional social structures and group identities as they have for the nation and national borders; so much so that they denounce family, varna, jathi and kula, religion and nation as 'upper caste' and 'patriarchal' constructs. The ultimate intent of their activism is to damage the Hindu social fiber and weaken social cohesion by De-Hinduising large segments of Hindu society. These fundamental and vital issues raised by Narendra Modi have been studied and analyzed with great objectivity by all the writers focusing on the different aspects of the uncontrolled, uncontrollable and non-accountable NGOs operating in India today in a treasonable and traitorous manner with the full knowledge and cooperation of all the functionally cosmetic and politically servile enforcement agencies of the Government of India like IB, CBI, RAW, Union Home Ministry etc. Each learned article in this book is marked by a patient pursuit of facts, and a cautious combination and comparison of them in a scientific manner. Each writer makes us aware that the main part of public education is not just the sterile acquisition of inert facts but learning how to make those facts live in the larger public interest of greater and greater public awareness of dangers and threats to our nation's identity and survival. All these great writers offer us the most direct representations of the possibilities of civil existence in India and the impending disaster of its dissolution in the absence of continuous public vigilance. Reading and discussing the seminal articles in this book, I have begun the wholesome act of repossession. I can declare from the house top that these writings not only scrape but drive away the haze of irresponsible and anti-national second handedness of the pseudo-secular mafia of mass media in India today.